CITC - Dudley Neighbors, Inc. Learn how to support the Dudley neighborhood while lowering your tax bill! · You can be an individual, corporation or non-profit to claim this tax credit! · It cuts the net cost of your contribution by up to 67%! · It doubles the benefit to DNI’s community land trust! What It Is: The CITC – signed into law by Governor Deval Patrick in 2012 - is designed to support high-impact, community-led economic development initiatives through a strategic, market-based approach that leverages private contributions and builds strong local partnerships. · Once you complete your donation, you will receive an acknowledgement letter and a link with the online CITC form. · Click on the link and complete Part 1 of the online CITC Form. 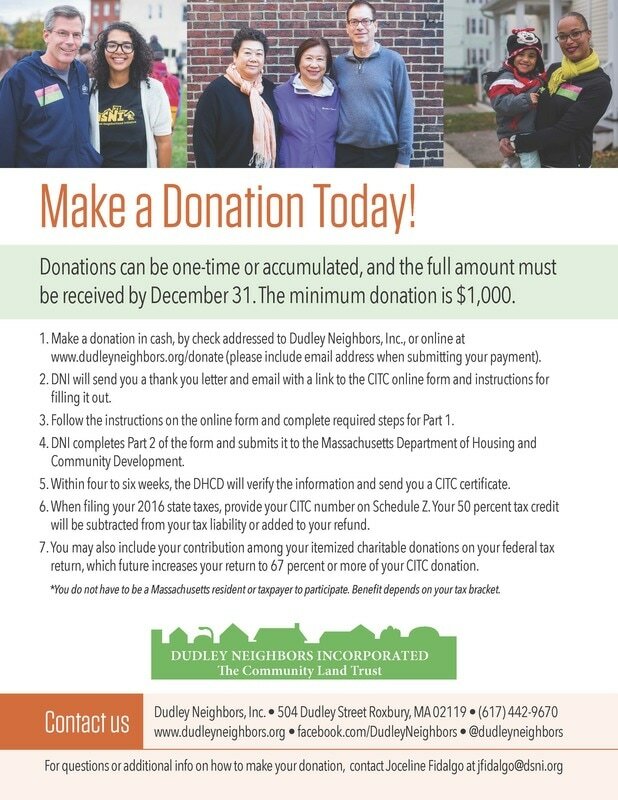 · MA Department of Revenue will then issue you a Tax Credit Certificate.